SOUTH BEND, Ind. 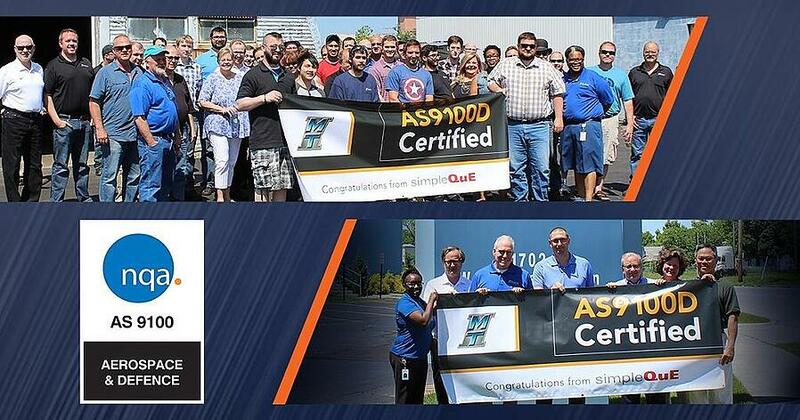 – Continuing its longtime dedication to excellence, Manufacturing Technology, Inc. (MTI) has renewed its AS9100 certification, a key quality indicator for companies working in the aerospace and defense industries. The certification ensures MTI’s friction welding machines, contract friction welding services and all other design processes are aligned with the strict standards for air and space travel. The certification covers both MTI’s machine build location on Washington Street and its 117,000-square-foot Manufacturing Services building on Sheridan Street. MTI's UK location also holds this certification. “This renewed AS9100 certification tells customers our welds can be used in some of the most advanced machines in the world," says MTI President and CEO Dan Adams. "We are committed to a high level of quality every day and this is proof of that." MTI has established itself as a leader in friction welding, including Rotary Friction, Linear Friction, and Friction Stir Welding technologies. In addition to contract manufacturing services, MTI has delivered machines for aerospace, oil and gas, automotive, and military applications. A family owned business founded in 1926, MTI employs 185 people in their South Bend and United Kingdom locations.